Today is WoW Wednesday and you are going to love. love. love what I have found for you this week! Have you ever wondered if you could paint your washer and dryer? Well, Erin at How To Nest For Less has come up with the most awesome way to update a tired washer and dryer! Can you see how cute this would be in your own laundry room? I have always wanted to try something different to jazz up my pair and this may just be the ticket! Erin’s motto on her blog “Is designing one room at a time on a dime.” Love that! Jump on over and see how Erin did DIY project here! What did you think? I’d love to hear your feedback! Head on over to my Facebook Page and let me know about it. If you have something you would like me to feature just let me know! Want to see other WoW Wednesday posts click here! Erin, congrats on a great job and don’t forget to take your “I’m Featured” button with you! Love this idea! 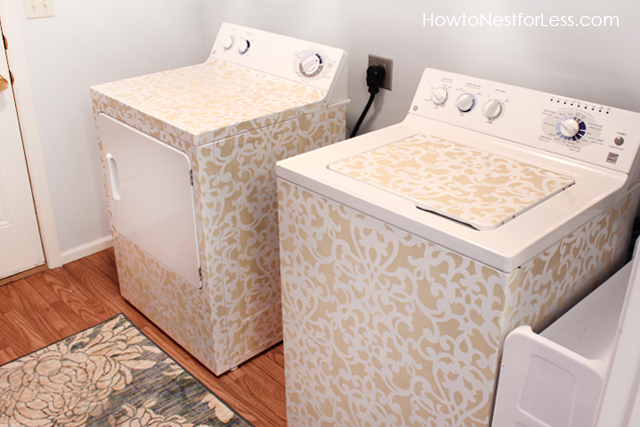 I think it is a great way to add a little fun to the laundry room! I totally agree! It is so clever! What a lovely blog – thanks for the tips, i’ll be back for more! Thanks for stopping by! I am glad you enjoyed my blog. Hope to see you again soon! You are welcome, but thank you for doing such a great project and sharing it! I am in love! Love it! That is such a great idea if you have a plain washer and dryer set. I know right! I think this is brilliant!